Determine the gearing for your car, truck, motorcycle...any manual transmission up to six speeds! This tool allows you to easily chart MPH or KPH against engine RPM, simply enter in the gearing and wheel height in the yellow boxes and you're ready to go! 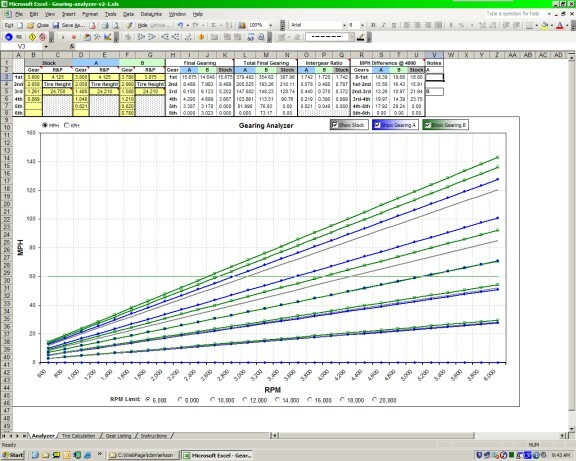 Up to three graphs can be simultaneously viewed at any time along with other calculations to help you pick the best gearing solution for your transmission. You can select MPH or KPH at any time as well as change the RPM viewing limit range (from 6000 to 20,000 rpm) -- this is great for vehicles with relatively lower RPM ranges. Now you can instantly see approximate speeds for every gear change and tire change. Also included in this workbook is a tire diameter calculator, Final Gearing calculations, Total Final Gearing calculations, Intergear Ratio calculations, MPH/KPH speed difference between gears calculations, and a space for notes. This gives you the quick visual information you need to make an educated decision. Requires Microsoft Excel 2007 or newer. Uses macros so you need to have that enabled. McAfee scanned so virus free.